After years of largely brutal budget cuts and workforce reductions that hampered their enforcement efforts, the Internal Revenue Service recently emerged relatively unscathed from the first round of President Trump’s budget cuts for 2018. While early forecasts suggested the IRS would be hit with a 14 percent reduction from 2017 levels, Treasury Secretary Steven Mnuchin apparently successfully intervened to blunt the cut. Trump sent a preliminary budget request to Congress last month proposing deep cuts in most agencies but seeking a reduction of just two percent or $239 million from the IRS’s $11.2 billion fiscal 2017 spending level. The budget request states that the new, reduced spending level would be enough to “preserve key operations of the IRS,” including combating identification theft and tax fraud and improving tax collections to help reduce the deficit. The proposed budget would also shift resources to hasten the timetable for handling virtually all tax returns and correspondence electronically rather than on paper. But while IRS Commissioner John Koskinen dodged another budgetary bullet, his agency is still understaffed and could take years to rebuild its tax enforcement and auditing operations to previous levels. The IRS, once a feared and highly respected agency, saw its influence diminished after congressional Republicans began slashing its budget in protest of the agency’s harsh responses to requests from conservative activist groups for tax-exempt status during the 2012 election. In a letter last week to a House appropriations subcommittee, 48 Democrats including Rep. Keith Ellison of Minnesota urged that Congress boost IRS spending by $1.7 billion in the coming year rather than impose further cutbacks. “An increase in funding for the IRS will reverse the short-sighted and damaging budget cuts which have increased our national debt, left the IRS ill-equipped to combat refund errors and fraud, drastically reduced taxpayer services, dangerously reduced audits, and limits the IRS’s ability to implement new laws passed by Congress,” the letter states. Nearly 80 percent of all tax returns are filed electronically, which accounts for the reduction of some IRS staffers. Similarly, the IRS website and automated phone service have taken some of the burdens away from customer service agents, who have also been reduced. The agency is also considering 16 “electronic recommendations” that would continue to transform the agency into a digital enterprise. Over the past five years, as the agency’s budget continued to shrink, the IRS lost almost 15 percent of its workforce, according to the new 2016 IRS Data Book. “Key measures of enforcement activity, including audit rates, have also declined in several categories,” the IRS said in a summary accompanying the new data compilation. By 2016, the IRS workforce totaled 77,924 full-time equivalent employees, down slightly from 79,890 in 2015. That workforce included 10,174 revenue agents, 8,235 customer service representative, 8,267 tax examiners, 2,184 special agents and scores of seasonal employees. According to the Center on Budget and Policy Priorities, the agency’s current budget of $11.2 billion is 18 percent below the 2010 level, after adjusting for inflation. Because the agency is labor intensive and most IRS funding goes for staffing, the budget cuts have rippled through the workforce. Arguably, the biggest loss has been in the enforcement division – which over the years has taken the lead in cracking down on tax scofflaws and recovering billions in unpaid taxes. 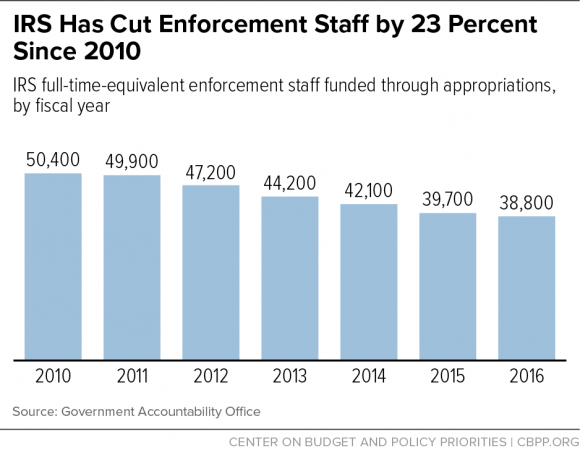 The agency’s enforcement staff has steadily declined, from more than 50,000 in 2010 to just 38,000 in 2016, according to the Government Accountability Office (GAO). Indeed, the agency conducted just 1.2 million examinations of tax returns in 2013, a 16 percent decline from audits the previous year. Although the IRS data document covers only the past two years, a more expansive analysis by The Washington Post published last month concluded that 1.2 million reviews were the lowest number since 2004. It also represented the sixth consecutive year of decline. Long under attack by GOP lawmakers on Capitol Hill that included a failed effort to impeach him, Koskinen has been forced to make significant cutbacks in audits and compliance operations. That, in turn, has helped to spawn widespread tax cheating and major revenue losses, as The Fiscal Times previously reported. During his Senate confirmation hearing, Mnuchin stressed the need to beef up the IRS enforcement division, saying “That is an important part of fixing the tax gap.” Treasury officials estimate that every additional $1 invested in enforcement can generate $6 of additional tax revenue. The IRS is charged with a broad array of responsibilities. During Fiscal Year 2016, the agency collected more than $3.3 trillion, processed more than 244 million tax returns and other forms, and issued more than $426 billion in tax refunds. IRS employees assisted more than 68 million taxpayers over the telephone through live assistance and automated services, taxpayers used the IRS website in far greater numbers. The post popular feature on IRS.gov, “Where’s My Refund,” was used almost 300 million times last year – up 27 percent from the year before. The IRS is also responsible for helping implement the Affordable Care Act, both by providing refundable tax credit subsidies to moderate to middle-income Americans who qualify for health insurance coverage and by enforcing a mandate penalizing uninsured people who don’t apply for coverage. President Trump and congressional Republican leaders are planning to simplify the tax code, which could ease the workload. But the trillions of dollars in proposed tax cuts would be the first major overhaul of the federal tax system since 1986, requiring new training for staff. The White House is still figuring out the best path forward on tax reform, though it does have one potential starting point: the tax plans that the Trump transition team developed between election night and the inauguration. Politico obtained a copy of the transition document that essentially outlines many of the key tax proposals floated by Trump and his campaign advisers during the 2016 campaign. On the individual side of the tax code, for example, Trump would collapse the current seven brackets to three brackets of 12 percent, 25 percent and 33 percent, while keeping the capital gains rates as they are and repealing the estate tax. On the corporate side, Trump would lower the rate from 35 percent to 15 percent for all types of businesses and wipe out the corporate alternative minimum tax. The plan would also repatriate corporate profits from overseas at a one-time rate of 10 percent and scrap most corporate tax deductions, other than research and development credits.